A Haitian woman is 6 times more likely to die from cervical cancer than her American sister. Family Health Ministries focuses on cervical cancer prevention in Haiti. Cervical disease is directly associated with Human Papillomavirus (HPV). Since 2007, FHM has conducted HPV screening and treatment for women in Haiti. In 2012, a Clinton Bush Haiti Fund grant enabled the expansion of the HPV screening program. With the help of many Haitian and American partners, FHM continues to develop new programs and methods to fight HPV in Haiti. Watch the videos to learn how cervical cancer affects Haitian women. Why Worry About Cervical Cancer? In Haiti, cervical cancer mortality ranks among the world’s highest according to the The WHO/ICO Information Centre on HPV and Cervical Cancer. Furthermore, the incidence continues to rise at a rapid pace each year, underscoring the need for preventive measures and access to treatment. Cervical disease is easily curable if caught early; however, in developing countries like Haiti with limited access to treatment, the disease can be fatal. Haitian women are the economic strength of the market place and the mainstay of the household. If cervical cancer strikes the mother, the whole family structure is threatened. Since 1993, Family Health Ministries has collaborated with local Haitian physicians in screening women for cervical disease. 2001: In collaboration with students at Duke University Engineering, Family Health Ministries developed a low-cost, portable, battery-powered colposcope to assist in cervical disease diagnosis. With a generous grant from Goldman Sachs we were able to mass-produce the FHM’s CerviScope and it is now available to health care providers at $750 per unit. Read more about the colposcope development under our research page. 2002: Leogane Haiti: Dr. Delson Merisier and Family Health Ministries launched the first screening clinic at Hopital St. Croix using conventional pap smears. The cervical cancer prevention program expanded to FHM’s Blanchard Clinic in Port-au-Prince in August 2009. 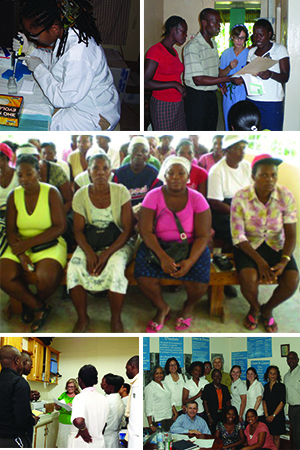 2006: FHM brought HPV screening to Haiti to replace conventional pap smears in our women’s health clinics. Since 2007, more than 14,000 women from Leogane and Port-au-Prince have been screened for HPV. Approximately 19% of the screened population have tested positive for HPV. Follow up services that include colposcopy and cryotherapy are provided. December 2012: Family Health Ministries received a grant of $731,130 from the Clinton Bush Haiti Fund to support screening of 10,000 additional Haitian women for cervical cancer. This grant allowed FHM, in Partnership with Fondation pour la Santé Reproductrice et l’Education Familiale (FOSREF), to open five new cervical cancer screening clinics in Port-au-Prince. The grant also provided funding to set up the first HPV lab in Haiti to run QIAGEN’s HC-2 assay in-county. Prior to this lab, all HPV samples were shipped to the US for processing. Vivien Tsu, Ph.D., M.P.H., and José Jerónimo, M.D. Family Health Ministries provides cervical cancer education to Haitian women before their HPV screening. Download a PDF version of the educational brochure in English or in Kreyol (Haitian Creole).